Will books full of animation, graphics, video, photos, sound, music and 3D embedded in stories be the future of what we read and call books, or are “enhanced” books a whole new media? Are print books and magazines close to extinction or is this public-turning to the WEB and eBook readers for stories and news a passing fancy? Who will write the books of the future? You’ve heard terms like eBooks, iBooks, enhanced books, transmedia, multimedia, interactive multimedia, ePub,touch-enabled books – what’s up with all the names? If you want to try your hand at writing one of these New Media (yikes, yet another name!) books, can you do it on your own or will you need to hire a programmer and other media and tech experts? Should you create an eBook or an app – say what? 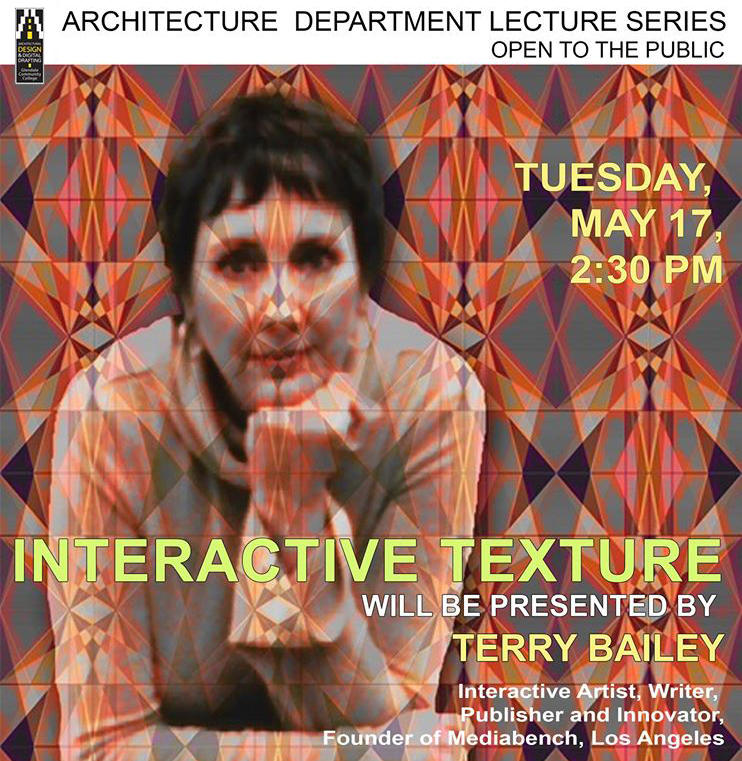 Our presenter, New-Media author Terry Bailey will share her perspective on these questions along with a look at interactive multimedia book creation tools, her own creation stories, history and thoughts about the future of publishing. 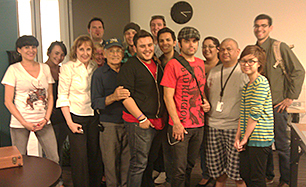 Terry preseneted a workshop at OfficeSlice in Sherman Oaks. 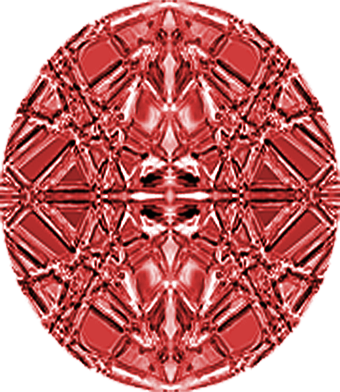 Your brand identifies you, makes your business and products memorable, and separates you from your competitors. Every encounter someone has with your brand is an opportunity to build your brand and customer loyalty. Your brand gives your customers something to be loyal to – yes, we have relationships with the brands we love! Day One: We’ll examine how successful brands are built, focusing on brand identity, brand messaging and brand marketing. Day Two: We’ll strategize real world cases (including your personal and company brand) to develop a brand’s visual identity, messaging system, and information structure - across media formats including print and web. 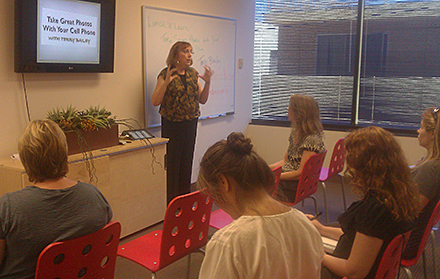 Terry presented a LunchNLearn workshop at OfficeSlice in Sherman Oaks. So many business people and non-photographers today are taking photos with their cells. Pictures have become a mainstay of our websites and Facebook pages. There are times when we need to hire a professional, but everyone can learn to take photos that are closer to professional quality. Come learn how to make your websites and Facebook pages look more professional with a few simple photography tips. 2013 at Version-X Design, N. Hollywood, CA, sponsored by Behance,The Tension between Creative and Innovative: Reflections of an Interactive Designer and Technologist. "The event was a great success.Terry Bailey, new media designer and interactive multimedia author, talked about the importance of UX and interface design in every aspect of our world and how we can draw inspiration from unexpected places for an intuitive user experience." Digital Marketing and Branding: It's All About Your Target Audience, Not You! Terry was profiled in the Pasadena Weekly:"Mission Possible: Renaissance woman Terry Bailey brings others up to speed with changing and challenging technology. 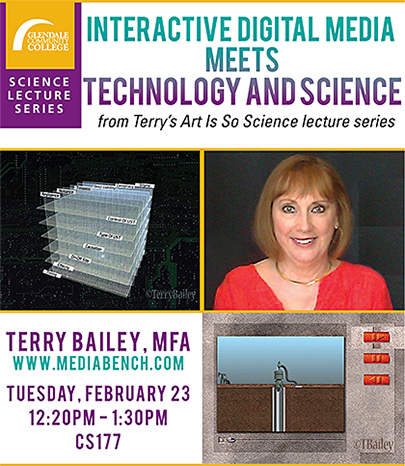 Terry Bailey has a mission: get women and girls up to speed with technology. . . . Bailey seeks to remedy what she sees as a severe deficit in women's grasp of computers and digital communication. Females may use technology, but we are not much involved in creating it, a loss for everyone. Bailey lived in Glendale for years but is now a resident of Pasadena. She's had a remarkable career, usually the only woman in the fields she's selected. Strong in both right- and left-brain pursuits, she's a creative "techie." While the so-called "conventional" wisdom is that science and the arts do not mix, shaking up oil and vinegar takes two seemingly opposite ingredients and makes dressing. Bailey mixes it all up and becomes more than the sum of her parts. I hope she doesn't mind me likening her to delicious vinaigrette! Another non-culinary way to label the label-defying Bailey is to call her a Renaissance woman. Look at her Web site (www.mediabench.com) and you'll see she covers a lot of territory. She's a digital communication consultant, artist, college lecturer, singer and novelist." Click here for full article. 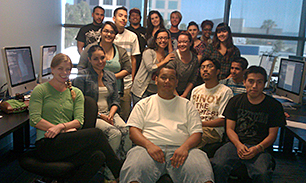 2012 - Terry's Digital Identity / Branding class immediately following their final presentations! mediabench is under copyright protection of © Terry Bailey, 1997-2016, all rights reserved.